With their long necks, beautiful eyes and regal bearing, the Giraffe is an awe inspiring creature whose home is on the African plains. Their unique biology gives rise to certain problems not experienced by other animals, and sometimes their behaviour might look quite bizarre. Here are some fascinating facts about these graceful creatures. 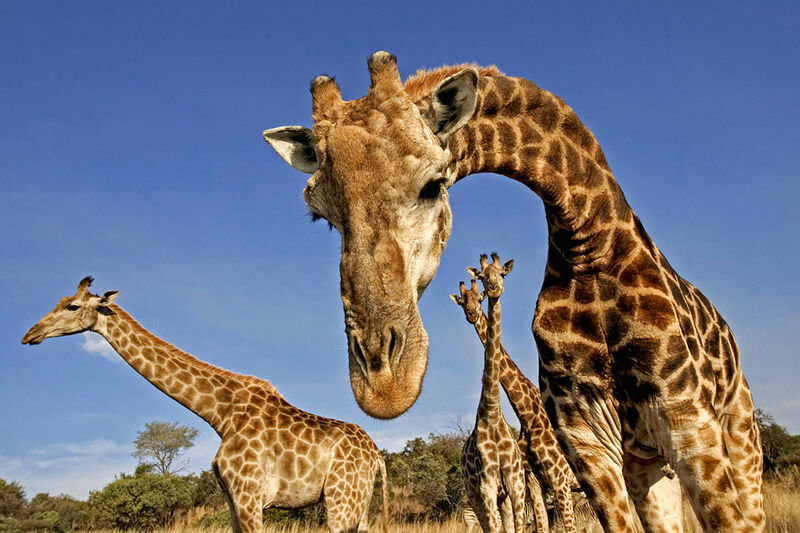 Giraffes are the tallest land animals in the world, with their legs alone being taller than most humans (6ft). Even new born babies are taller than most humans. Male Giraffes can grow up to 18 feet tall, and weigh as much as a pickup truck (about 3000 lbs). Their tongues are long – up to 18 inches long, so as to allow them to forage on trees that other animals would avoid, like acacia trees, and are darkly coloured to protect against frequent sun exposure. Their hearts are huge, weighing up to 24lb, allowing them to pump up to 20 gallons of blood every minute. Their height gives them an advantage in spotting predators across the savanna plains, but is disadvantageous when it comes to drinking water at the waterhole – they have to spread their legs and bend down in an awkward position, making them vulnerable to predators. Their necks are 5 to 6 feet long, but contain the same number of vertebrae as humans (7). This is because each vertebra is super-sized – up to 10 inches long. Their distinctive spots serve a good camouflage from predators. The jugular veins contain a series of one way valves preventing excess blood flow to the brain when the Giraffe lowers its head. Their feet are the size of a dinner plate (12 inches across), and the intestines of an adult Giraffe can measure more than 230 feet in length. 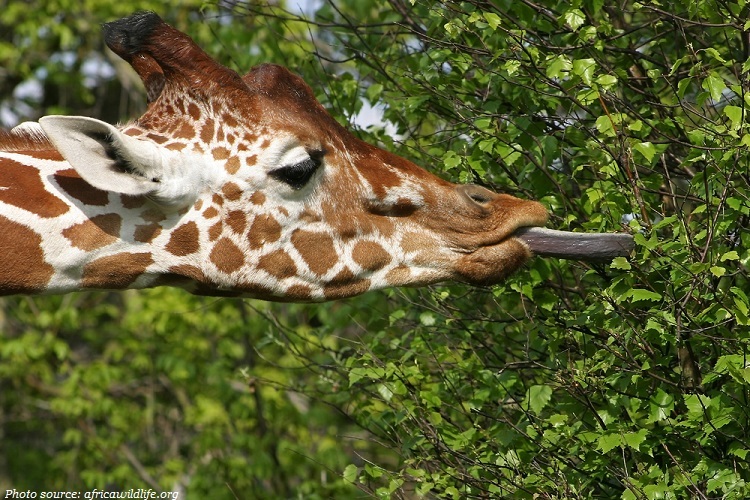 Before mating, the female Giraffe has to urinate in the male’s mouth, which allows him to determine if the female is fertile. Females can become pregnant at 5 years, and carry their babies for 15 months, giving birth while standing. The baby Giraffe gets a rude welcome into the world, dropping more than 5 feet to the ground during birth. 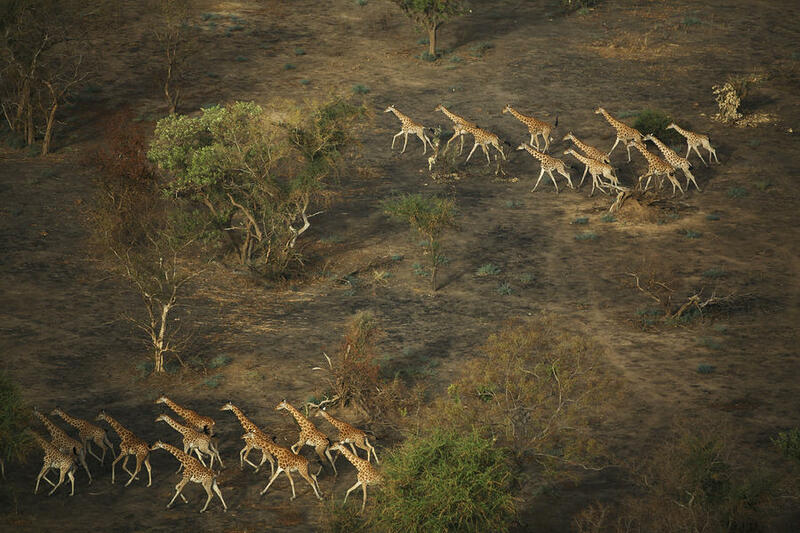 Baby Giraffes can run alongside their mums within 10 hours of being born. Giraffes don’t need a lot of sleep – anything between 10min to 2 hours a day with the shorter naps taken standing up. They have two modes of locomotion – fast and horrifyingly fast….or walking and galloping…so you had better make sure the Giraffe isn’t chasing you. While walking leisurely, a Giraffe can cover 15 feet with every step, and a galloping Giraffe can record a speed of 35 miles per hour. However, they can run out of breath quickly due to their long windpipes. Males and females eat from different parts of the same tree, thus preventing competition between the two. They don’t need to drink a lot of water, only once every several days, as they get most of their water from the plants they eat… in fact they can last longer than camels, without drinking water. They eat most of the time, and regurgitate their food to chew as cud. Their meal requirement is hundreds of pounds of leaves each week, and they have to travel long distances to find enough food. 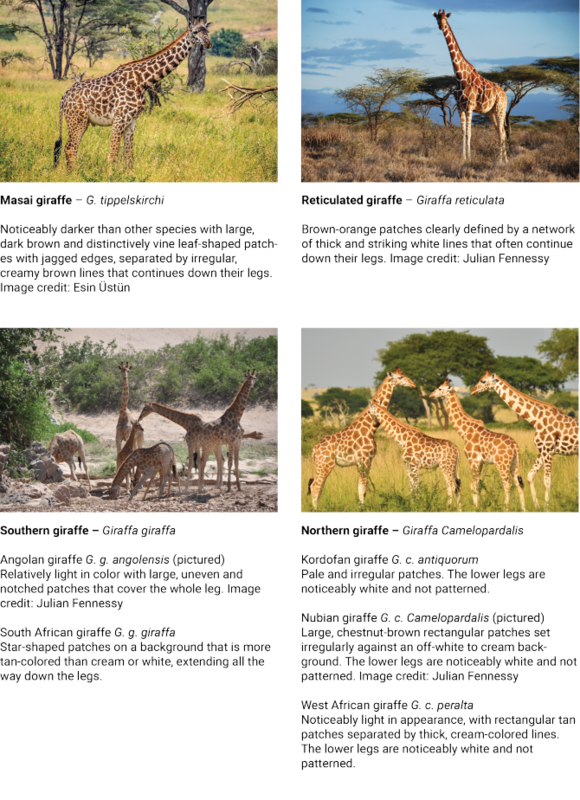 It was recently discovered that there are four different species of Giraffe, not only one. No one has ever seen Giraffes swim. They are already extinct in seven African countries. The famous toy manufacturer, Toys R Us, chose a cartoon Giraffe as their mascot in the 1950s. His name was Geoffrey the Giraffe, but was first known as Dr. G. Raffe. 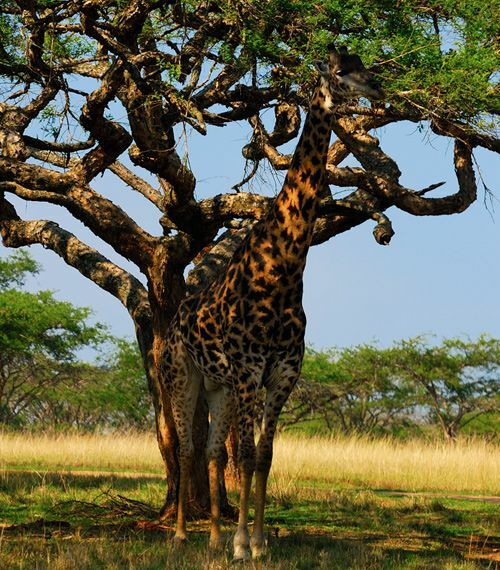 NASA created the “Lower Body Negative Pressure Process” to overcome the weakening of leg veins in weightless conditions, by observing Giraffes at birth. Their scientific name is Giraffa Camelopardalis, from the ancient Greek belief that they are Camels wearing a Leopard’s coat.